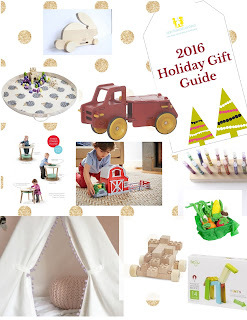 The holidays are around the corner and as moms, or mom to be’s, we are all starting to think about what Santa, or whoever does the gifting in your home, will bring to the munchkins in your life. So, so, so many choices, but how do you choose the ‘perfect’ toy that your little one will love? 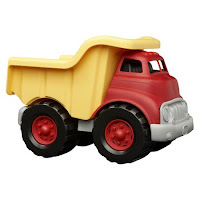 One key factor is to choose toys that will not expose your young children to toxic chemicals. As my son said to me last year, “don’t worry mommy, Santa wouldn't put that (toxic chemicals) in our toys”…… oooohhh but it seems he sometimes does! You see, nasty chemicals are actually quite common in today’s most popular toys; we are talking about hormone disrupting chemicals in some plastic or smelling toys, the infamous neurotoxin lead which is still found in some metal and plastic toys, to name just two. So, how to you avoid purchasing toys that will expose your children to a troubling number of chemicals? Instead of: metal trinkets, like children’s play jewelry, which often contain cadmium a known human carcinogen that has also been linked to learning disabilities. Metal toys can also contain lead and lead based paint. Instead of: products that are made of polyurethane foam (kiddie soft seating, baby changers, possibly anything with padding). These materials almost always contain flame retardant chemicals, which have been linked to learning disorders, cancer, hormone disruption, infertility and other serious health problems. 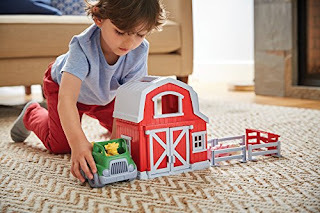 Instead of: buying toys that are made abroad, specifically in Asia ( some products made in Asia are reliable and chemical-free but unless the company has a proven track record of non-toxic products, the reality is that the "Made in China" and similar labels are not that trustworthy). TRY THIS: buying local from small trusted retailers in the US. 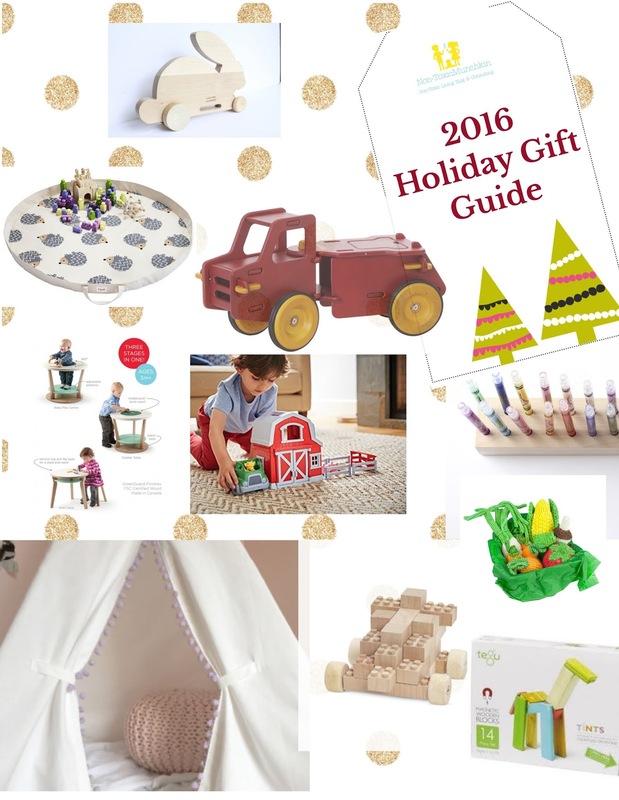 There are so many great company's producing amazing toys with natural, non-toxic materials! WE spotlight various in our list below! Toys made in Europe also tend to follow more stringent chemical laws. 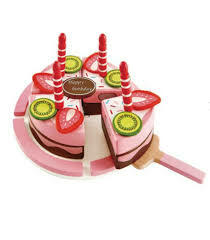 Instead of: Smelly toys; if it smells like plastic it probably is made of PVC/vinyl which is a known human carcinogen. If it smells ‘fruity’ the toy probably contains phthalates, known endocrine disruptor's. 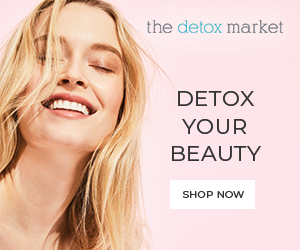 Shop at reputable non-toxic toy outlets and brands. 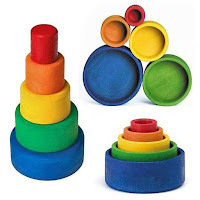 Our Amazon store is a great start, but there are many small brick and mortal shops that carry great toys and online the Tot has a curated, one stop shop for non-toxic, adorable and stylish toys. 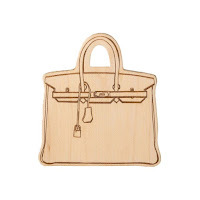 that it is also made from all-natural maple wood, which is naturally antibacterial and non-splintering. 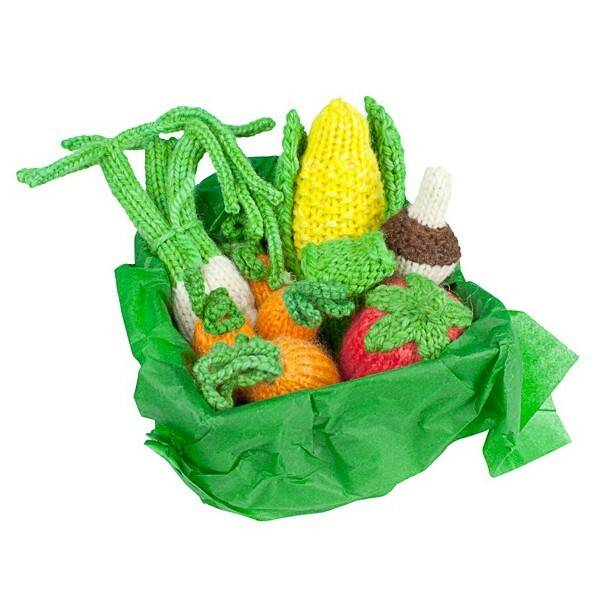 Made in NYC, this is an adorable, stylish and non-toxic small gift. For moms looking for a softer more malleable teether than the solid wood options, Mia the Lamb is a sweet and safe choice. 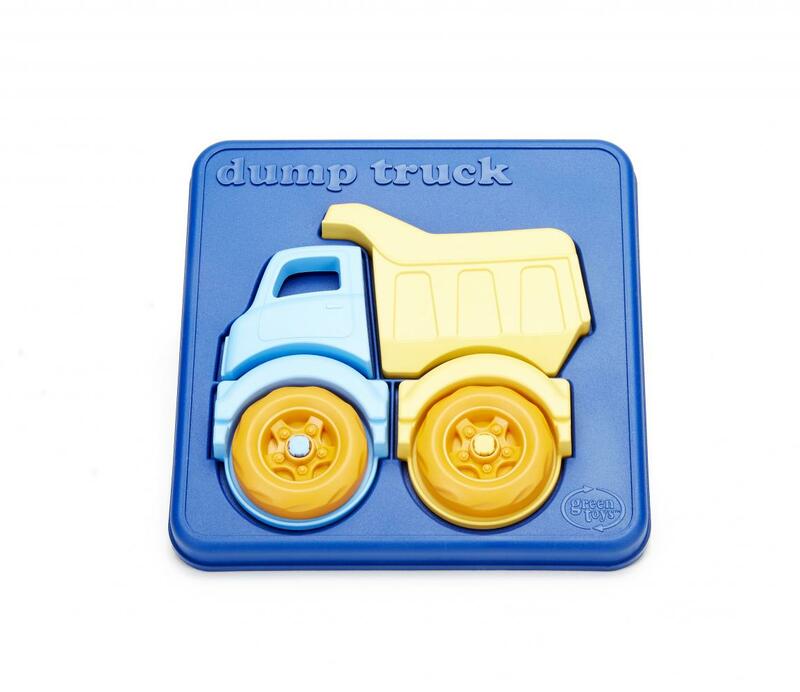 It is made of 100% pure, natural rubber and is minimally processed and certified BPA, PVC, Phthalate and Nitrosamine free. It is also painted with food-grade paints and entirely biodegradable. Your baby will love squeezing it and biting on it all day long! 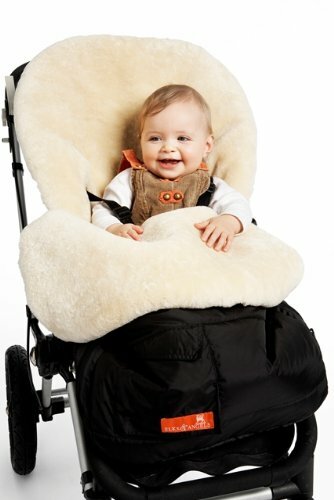 Suitable for both babies and older children since it is soft and bouncy. I love that it is soft, flexible and easy to grasp. Since it is made from 100% natural rubber (like the Hevea Flower Orthodontic 3+ pacifiers we love), the ball is free from nasty chemicals and safe for the baby to chew on. 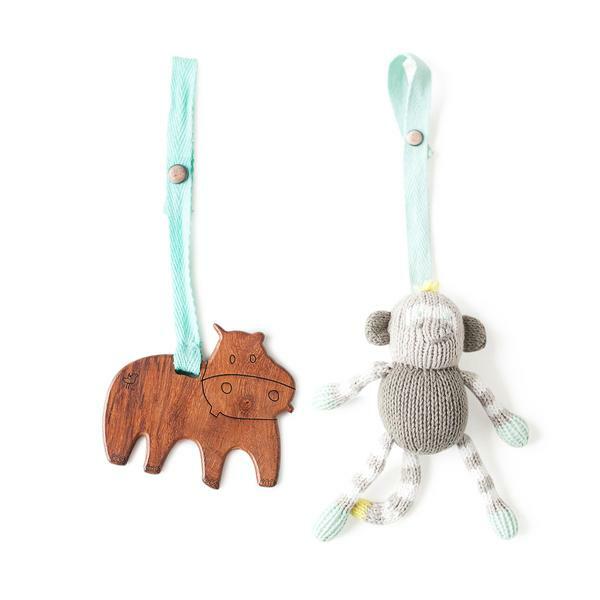 For those who can’t decide if they like wooden or softer toys better for baby, Finn + Emma offers a 2 piece wood and knit set that brilliantly attach to the stroller or car seat. I love that the soft toy is hand knitted and made from organic cotton yarn and stuffed with sheep’s wool and the wood is Indian hardwood and finished with safe, non-toxic beeswax. The reality is that the under 6 month crowd doesn't do a lot of playing, so there is no need for a lot of toys. A great, super useful gift that will be used everyday are swaddle blankets. They can be used as a light blanket, to change a baby’s diaper on the go, to create some shade or privacy (while breastfeeding for example), for swaddling, to wipe baby’s face, as a tummy time blanket, to protect your shoulder when holding baby and more. Swaddles are one of the most useful items for new mums and babies in the first months, and these particular swaddles are beautifully designed- I just love their oh so cool french-y prints. 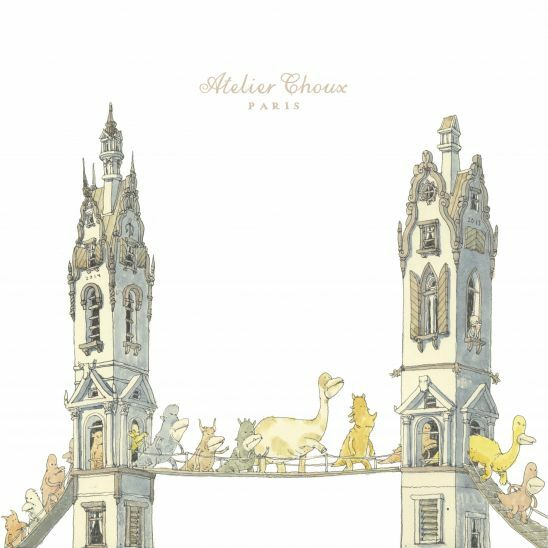 I also love the fact that they are made of certified organic cotton, made in France and large size. As a side note, their Instagram account is as sweet as you would imagine it to be. 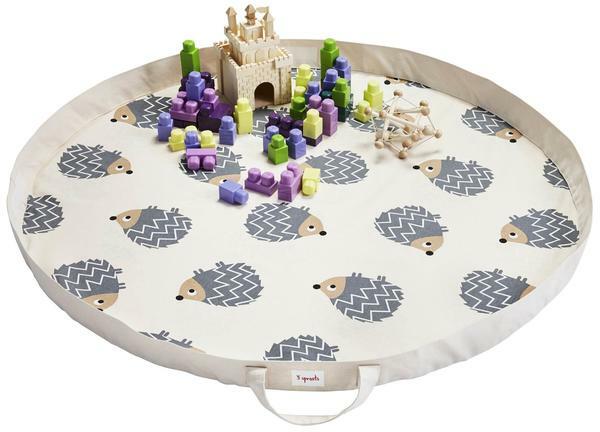 If you are a fan of the Finn + Emma stroller toys, this play gym is a brilliant addition to your home and playtime. 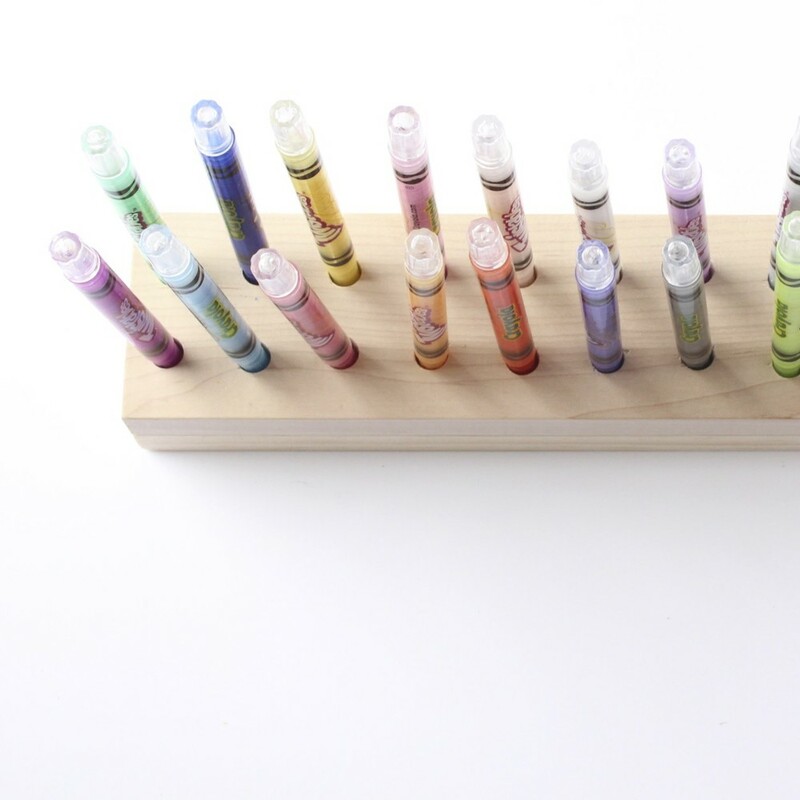 Made of 100% birch wood and finished with non-toxic stains and lacquers (free of lead, phthalate, nickel, mercury, and VOC’s). 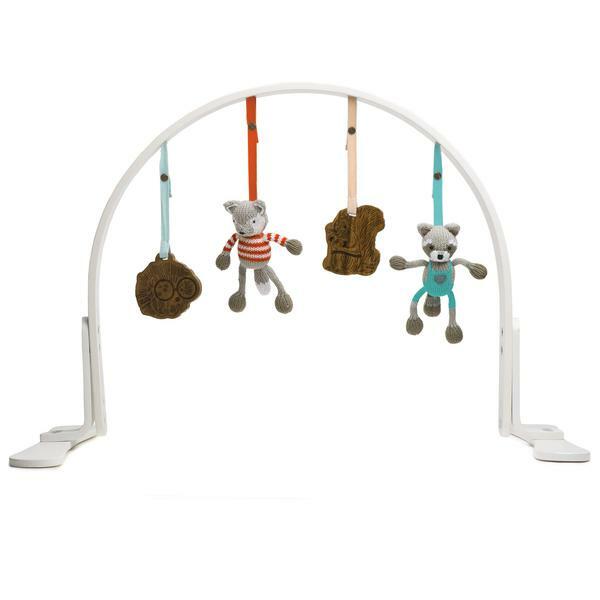 You can interchange any of your, Finn + Emma buddies in the play gym, car, stroller or high chair. Made of 100% cotton canvas, these storage bags open and transform into a play mat to keep toys contained in an area (older kids can use to keep Legos and the like contained too) - when you are done playing just fold the bag and put away. These solid wood, hand crafted in Germany, stacking toys are ideal for little hands to grasp and learn to stack, sort and grab. I love that they use non toxic water-based stains and food-grade plant oils for their bright colors. Plastic hating, design loving parents rejoice! Finally an esthetically beautiful, amazingly practical and completely non-toxic baby play center has been launched to the market. This is genius and game changing. Seriously. 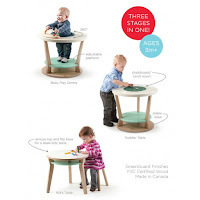 The Bobbin starts off as a Baby play Center (where you place baby in the middle inside with support to play and observe life around her), then it can transition to a toddler table and finally it can be converted to a full fledged kids table. I mean, the price is steep but the Bobbin could easily be used daily for 8 years! Amazing! Available in the US exclusively at Sprout, San Francisco. Easy for little hands to hold and put together, this 4 piece puzzle is great at developing fine motor skills and eye-hand coordination. Made in the USA from 100% recycled plastic with no BPA, phthalates or PVC. 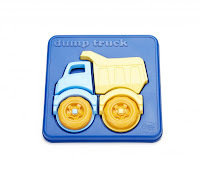 All little boys (and many little girls) love Green Toy’s trucks. 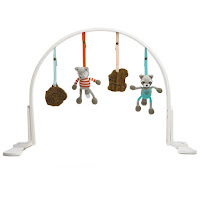 They are ideal to play at home, at the playground, in the bath and at the beach. I love their versatility and resistance and that they are made from 100% recycled plastic milk containers. My kids have their dump truck and Firetruck and still play with them after 5 years! 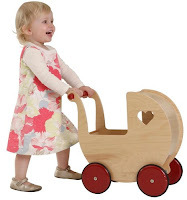 Mobile babies get to pretend to be mommy or daddy with with this sweet doll’s Pram. I love that the wheels are made of wood and rubber, the classic elegant design and the hours of make belief play that it invites. 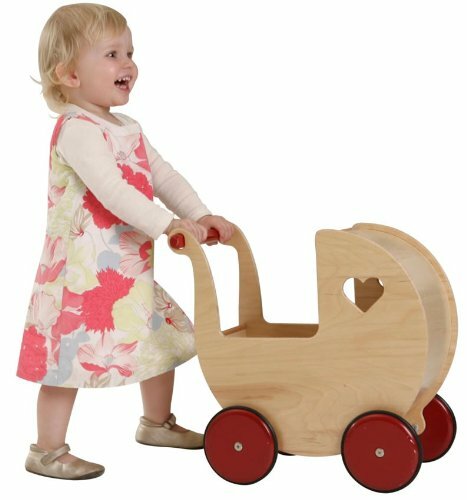 Available in both red and natural wood, this truck is the ideal gift for that little munchkin that loves things that go! 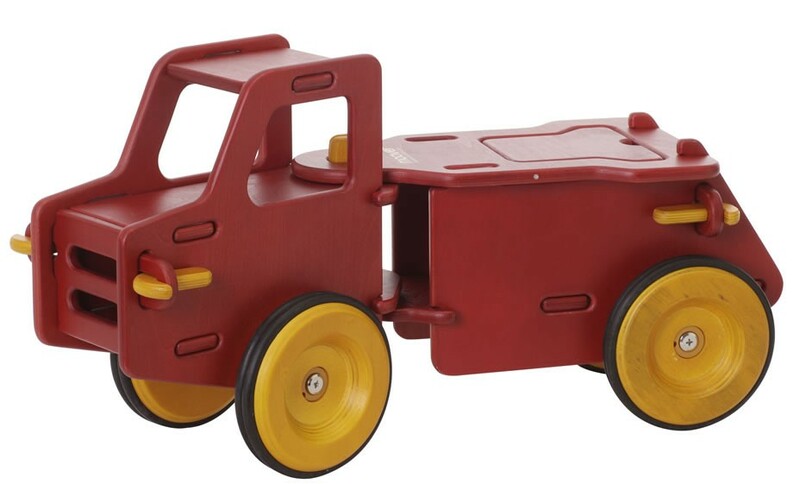 Sturdy enough for kids to ride on, (other truck models have space for a doll or teddy but are harder to maneuver). 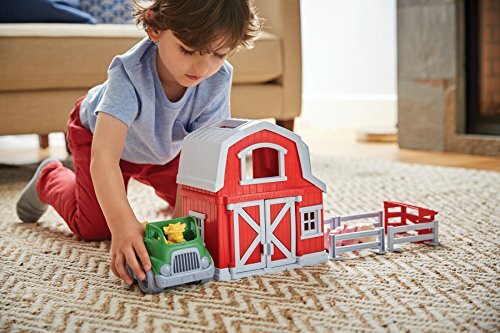 Truly a heirloom quality toy, this toy will be favorite from the time they start walking, and well through the preschool years and beyond. 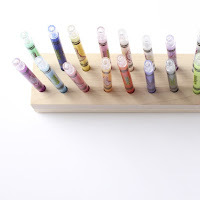 This eco-friendly, hardwood wood crayon block makes it easier for a hand to grasp ONE crayon, use it, and then return it to its spot - ideal for little artist (and their neat freak parents!) . I love that Little Miss Workbench is a small company based in Bellport Village, New York. 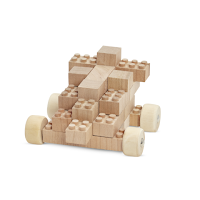 Our toys are handcrafted using sustainable American hardwoods and all-natural sealants. They are simple, durable, eco-friendly, child-friendly . Play food will inevitably be placed in your child’s mouth, so best to make sure it is made from safe non-toxic materials. This collection of fruits and vegetables are made from 100% wool and can also teach your child a thing or too about healthy eating! 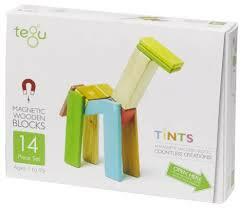 Blocks are always a great, open ended toy that will be used for years, since both little and older kids love them. These wooden blocks are extra fun because they are made from FSC-certified Honduran hardwoods and non-toxic materials and, kids absolutely love the fact that they are magnets. 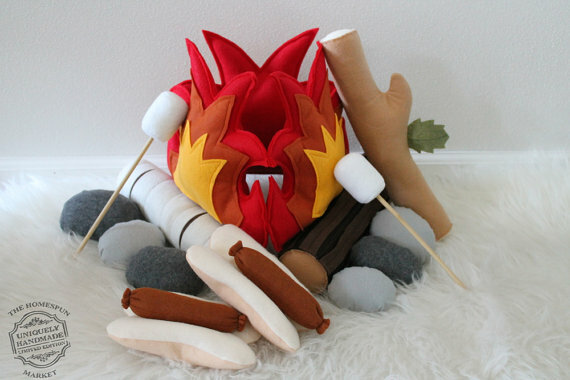 Boys and girls will love to pretend they are camping as they roast marsh mellows, stories and let their imaginations run wild. Boys and girls love pretending to be the chef in their own play kitchen. This is another gift that will surely grow with your child and stimulate your child’s imagination for years to come. I love that Hape’s kitchen is not only aesthetically stylish, but it is made from solid wood sourced from environmentally sustainably sourced forests with child-safe paint finish. 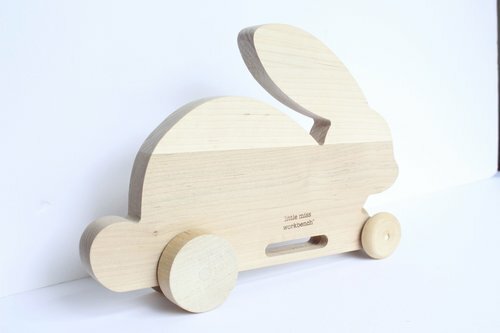 This gift will assure your tot will have a stylish ride for the next couple of years! This adjustable bike can convert from push-trike to balance bike and from small bike to tall bike, to support your little one at all of their stages of bike pre- riding. I love that its design and amazing value and the fact that it is made from 100% recycled plastic! Great for the environment and your family. For that boho little girl or boy in your life (there are other designs that are more gender neutral than this pink pom pom model!) - these teepees will make for a favorite hang out for years to come.